Limited collection! 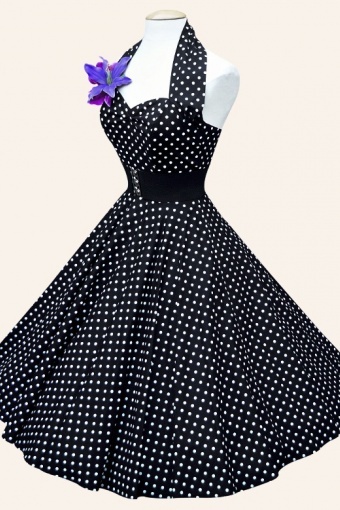 1950s reproduction Black Sateen Spot Swing dress. 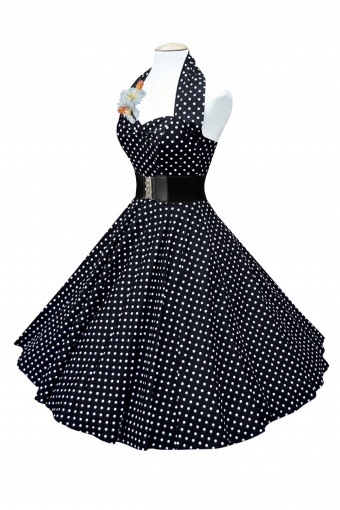 Polka dots have been a firm favourite with girls for well over 100 years. Perhaps it's because they are so versatile, in a spotty frock you can be anything from a ravishing rockabilly chick to a demure Fifties poppet, and everything in between! We are totally committed to quality. Our polka dot retro circle dresses are made from 100% crisp cotton and easy-care cotton sateen fabrics, and everything is created right here in London. Accessories (petticoats, belts, flowers) are NOT included and are sold seperately. We are totally committed to quality. Our polka dot retro circle dresses are made from easy-care cotton sateen fabrics, and everything is created in London.